This is the twenty-fourth in a series of posts that report on the state of the parties as measured by opinion polls. By pooling together all the available polling evidence we can reduce the impact of the random variation each individual survey inevitably produces. Most of the short term advances and setbacks in party polling fortunes are nothing more than random noise; the underlying trends – in which we are interested and which best assess the parties’ standings – are relatively stable and little influenced by day-to-day events. If there can ever be a definitive assessment of the parties’ standings, this is it. Further details of the method we use to build our estimates of public opinion can be found here. The Conservatives will be doubly cheered to see that Labour have declined steeply for the second month running, down 0.9% to38.4%. Labour are now down almost four points from their peak, and approaching their lowest scores since Ed Miliband took over as leader. They retain a healthy 8% lead over the Conservatives, but the recent softening in numbers must be a concern, particularly as it comes during a period without any significant positive economic news to bolster the government. Miliband will be hoping for a strong local election performance to boost morale and quieten critics. He will be helped in this regard by his predecessor’s appalling performance in 2009 – on the night when Hazel Blears and James Purnell launched their abortive putsch against him, Gordon Brown led Labour to their worst local election slump in decades. Even a modest rebound in support should be sufficient to capture hundreds of council seats, and enable Ed Miliband to declare steady recovery. UKIP’s Nigel Farage will also be scouring the local election returns closely. He has already delivered one significant organisational victory for his party, fielding a record slate of candidates for Thursday’s polling, surpassing the struggling Lib Dems. He can now truly claim to lead a party with national reach, though as yet one without even local power. Farage will hope for major gains in the deep blue county councils elected on Thursday, but to achieve this he must overcome a foe more formidable than the political establishment he rails against: Britain’s first past the post electoral system. UKIP support is very evenly spread geographically which, as the Lib Dems know very well, makes converting votes into seats and power extremely difficult. While his party scored another record rating with the Polling Observatory this month, up 0.3% to 11.5%, Farage’s candidates may find themselves with little to show for this on Friday evening if UKIP candidates surge to second place across the nation. Only a disciplined and coordinated targeting and mobilisation effort is likely to change this script. As yet, we simply do not know if UKIP possess this kind of organisational capacity. Thursday’s poll therefore provides us with a key indicator about UKIP’s ability to move from soaking up protest to wielding real influence. The Lib Dems will be hoping to avoid another local election bloodbath, having endured two already since joining the Coalition. Their poll ratings provide little cause for solace, slipping back to 9.1%but they will hope that deep local roots and the predominance of competition with the Conservatives rather than Labour will help them hold on in many seats on Thursday night. Nigel Farage may even help them by cutting into the vote of their national partners and local rivals, the Conservatives. It seems highly likely that, however the results pan out on the night, Nigel Farage will be the big story this weekend. UKIP continue to chalk up record poll numbers for a fourth party challenger, and are almost certain to win at least some council seats, while also providing a challenge to the established parties over a wider range of territory than ever seen before. 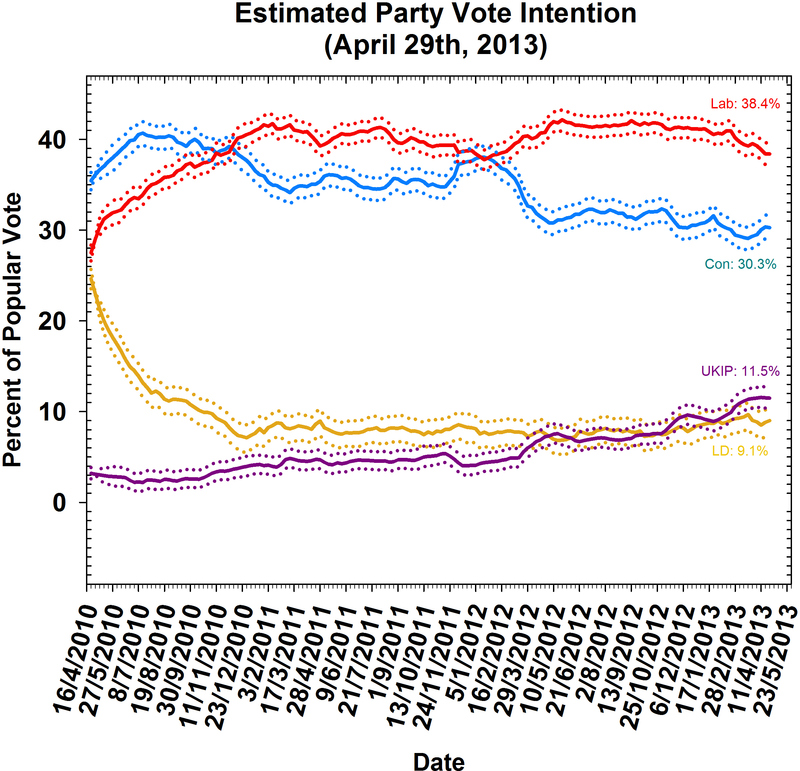 The momentum looks set to continue: UKIP fascinates media pundits and party apparatchiks in equal measure. Farage himself is a talented performer who can always be relied upon to deliver good copy, so the media look certain to keep him in the spotlight so long as his polling remains strong. There are those who think UKIP will melt in the media spotlight, undone by their candidates’ eccentricities or the contradictions in their policy ideas. This misunderstands the nature of UKIP supporters, who are less interested in finding a reasonable, responsible government than in delivering a kick to the shins of a political class they deem unreasonable and irresponsible. There is always a section of the electorate which is fed up with the incumbent, hostile to the principle opposition, and eager for any outlet for their frustration. In stagnant, struggling austerity Britain, this sentiment is more widespread than ever, and, thanks to the Coalition, UKIP have this vote all to themselves. Add to this continued public hostility to immigration, socially conservative voters who, like Lord Tebbit, no longer consider the Conservatives a friendly home, and Nigel Farage’s personal charisma, and you have a recipe which looks set to deliver the goods for some time to come, particularly in UKIP’s big home fixture: 2014′s European Parliament elections. So get used to the mustard trousers, the tweed jackets and the pints of bitter: we will be seeing plenty more of them during this Parliament.